As wireless carriers seek to fully monetize finite mobile network resources, they cannot afford to allow those resources to be wasted. Network congestion diminishes value for subscribers by creating the potential for service disruption, and therefore damages carriers’ ability to monetize their infrastructure investments. In the days when feature phones were on the cutting edge of mobile technology, wireless carriers exerted strong control over the device. Now that smartphones are increasingly prevalent, carriers have lost much of that control. Users can download any of countless thousands of mobile apps, and the operator cannot control the behavior of those apps or the impact of the associated data traffic. Chatty mobile apps constantly poll their servers for updates, in order to provide the always-on immediacy that users expect from the mobile experience. This background activity causes devices to constantly connect to the carrier network. Each connection attempt produces numerous signaling messages and consumes precious bandwidth. Often, these connections yield no benefit to the subscriber, since no updates are available. Different categories of mobile apps can have dramatically different profiles in terms of their impact on the network. Streaming video consumes a great deal of bandwidth, but creates minimal signaling activity. Messaging and social media apps place small demands on bandwidth, but create a huge volume of mobile signaling. 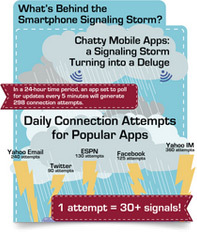 This mobile signaling storm can overwhelm network resources and create service outages. The signaling bottleneck in a 3G network is the radio network controller (RNC). In an LTE network, it is the mobility management entity (MME). In either type of network, the mobile signaling overload created by otherwise idle devices may keep users from checking email, looking up directions, streaming video, or even making a phone call. Excessive and unnecessary background activity presents an opportunity for mobile traffic optimization. The user experience for the subscriber base as a whole can be improved without adverse impact to any individual subscriber. Open Channel Traffic Optimization addresses the mobile signaling storm, significantly reducing both signaling and bandwidth consumption to relieve network congestion.